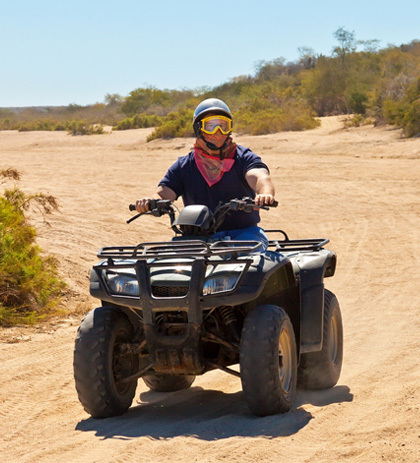 When you call Quivira home, you open the door to a world of wonderful attractions and exhilarating activities in Los Cabos. Great restaurants, vibrant nightlife, and charming shops mix with world-class recreation and eco-adventures on land and sea. From top-tier golf at the Quivira Golf Club to water sports, whale watching, deep-sea fishing and off-roading, you’ll find plenty of amusements in every direction. The surrounding desert offers unlimited riding possibilities. 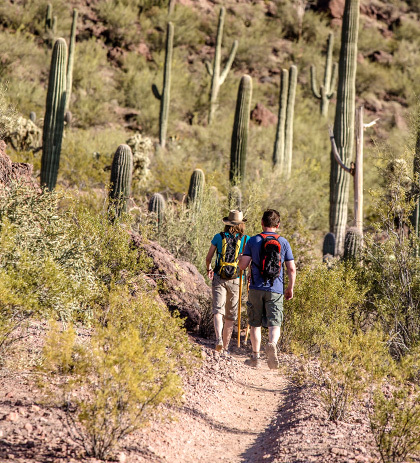 The desert and nearby mountains offer great rides, just a short distance from town. Explore rivers, which have waterfalls at certain times of year, and unparalleled mountain trails that offer spectacular views of the shoreline. Hike the previously indigenous-inhabited canyons of Sierra La Laguna, where increased levels of rainfall create a unique biosphere. See freshwater flow over granite boulders, as well as a waterfall that cascades into a pool where you can swim at the end of the hike! 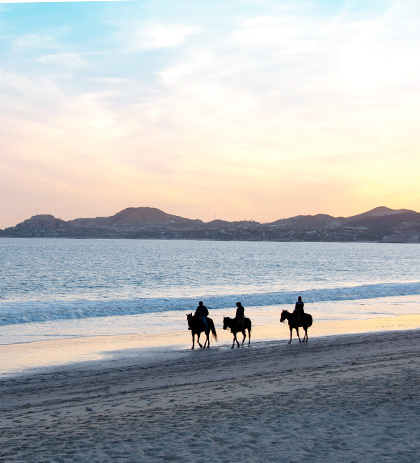 Suitable for beginners or experts, choose from beach or desert trails and Western or English saddles. This area is teeming with undersea life due, in part, to Los Cabos´ location in a transition zone between tropical and temperate waters. 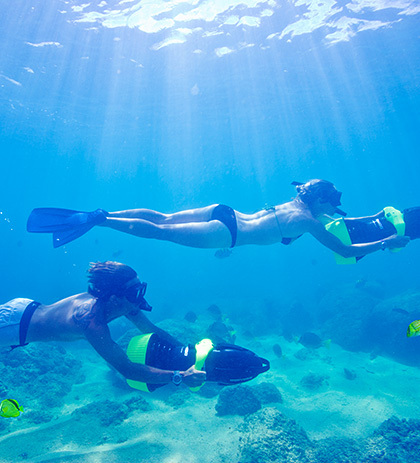 Underwater visibility sometimes reaches 120 feet. Water temperatures soar into the low 80s in the summer. You’ll find a mix of large fish (manta rays, amberjack, grouper) plus mammals, colorful tropical species, several shipwrecks, caves and canyon dives. Swim and interact with marine mammals at our world-class facility, which features a self-contained, world-class dolphin center. 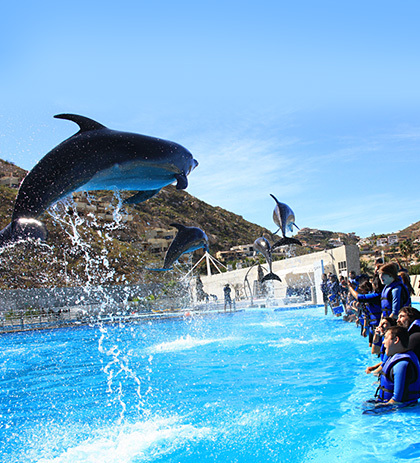 Guided by an instructor, you can swim freely for 30 minutes and even enjoy dolphin kisses, fin shakes and water rides. Enjoy the beautiful Los Cabos sunsets, the famous Los Cabos arch, the relaxing Sea of Cortes and the Pacific Ocean on a classic Los Cabos Sunset tour. Choose from a private boat, pirate ship, jazz boat, catamaran, and more to arrange the perfect outing. 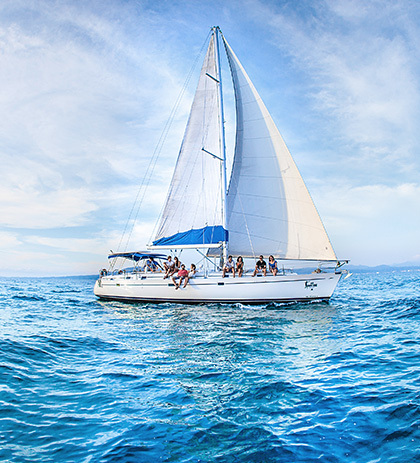 Sailing the peninsula’s waters ranks high among Los Cabos’ most sought-after activities. 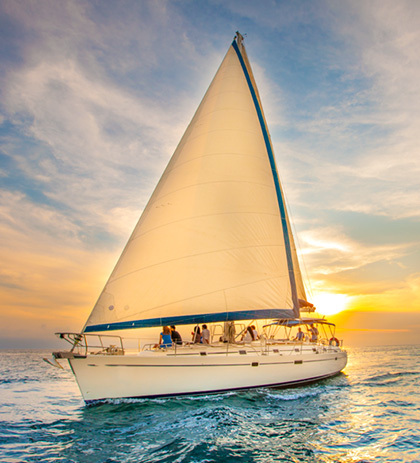 Yacht rentals in Los Cabos come in every category, starting with 28-35’ diesel vessels with a cabin, bathroom, shaded area, fighting chair, and fly bridge. Next are newer, mid-range vessels from 35-42’ with carpeted salons, a stateroom or two, kitchen, A/C, and other extras. At the top of the line are modern 50-80’ vessels offering every luxury imaginable. 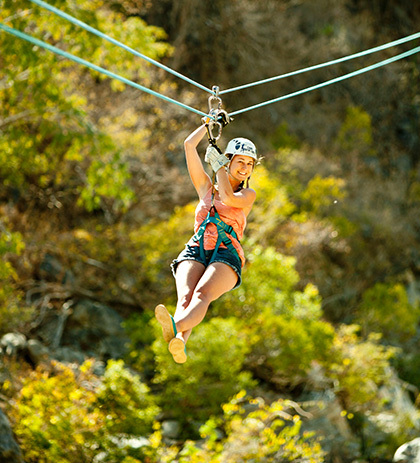 Enjoy the thrill of flying over beautiful desert scenery while safely suspended in a zip line harness. Of the world’s 21,000 gray whales, an estimated 11,000 make the journey of over 10,000 miles to bear their calves in the Pacific Coast lagoons north of Los Cabos. Many continue south around Land’s End and into the warm waters of the Sea of Cortes. From January through April, there are several ways to observe the magnificent cetaceans in their natural habitat . 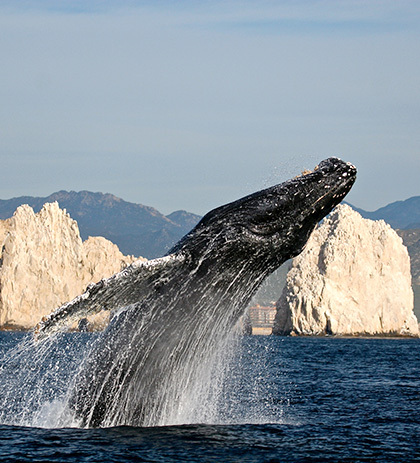 The whales are often close enough to the shores of Los Cabos to see from beaches and overlooks. There are several prime whale-viewing areas within Quivira. Many local tour companies also offer whale-watching trips, including two-and-a-half hour boat tours in the bays around Los Cabos, either by the catamaran or powerboat.